The so called Dark Ages have a lot to answer for. The concept that the acquisition of knowledge was a dangerous thing, led to the destruction of written records which perhaps could have explained the origins of the Morris. Popular belief however, sees Morris roots in the Moorish traditions of North Africa, which to this day embraces ritual dancing not dissimilar to the English Morris. But also other forms of Morris were taking place across Europe, which could just have easily influenced some of our English ritual dances. The oldest historical reference is 1448 in the inventory for Caister Castle in Norfolk, that lists a tapestry depicting Morris dancing. Later archives describe the Morris as an entertainment at the court of Elizabeth I. It is certain that the Morris was popular by the mid 17th century, however the austerity of the Puritans all but extinguished it. Thankfully pockets of resistence remained, particularly in Cotswold villages where the traditions were handed down from father to son. 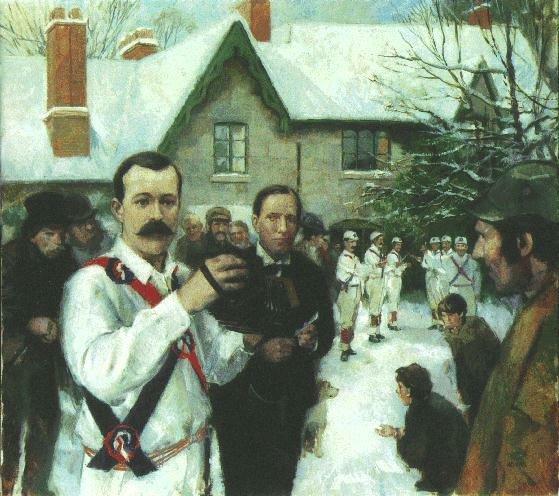 So the Morris survived through to the dawn of the 20th century when, by chance on Boxing Day 1899, a renowned folk-song collector, Cecil Sharp, met the Headington Quarry Morris Men. Enthralled by what he saw, Sharp resolved to dedicate much of his life to recording the Morris and thereby protect it for posterity.